How Can I Use These Free Borders? As with most things on the Internet, finding Celtic images isn't hard, but finding good free Celtic border clipart is a different story. Below I have presented five of my designs that are completely free to download, and are all in an easy to use JPEG format. You can manipulate these images how you wish, and can even import them into a basic Word package; you don't need any fancy DTP software. Click on the image to get a larger view, and if you decide you like it, use the download link at the bottom of the page — easy! I will also offer tips throughout, on how you can best use these designs, perhaps alter them to your needs, and even show you how easy it is to create them yourself. 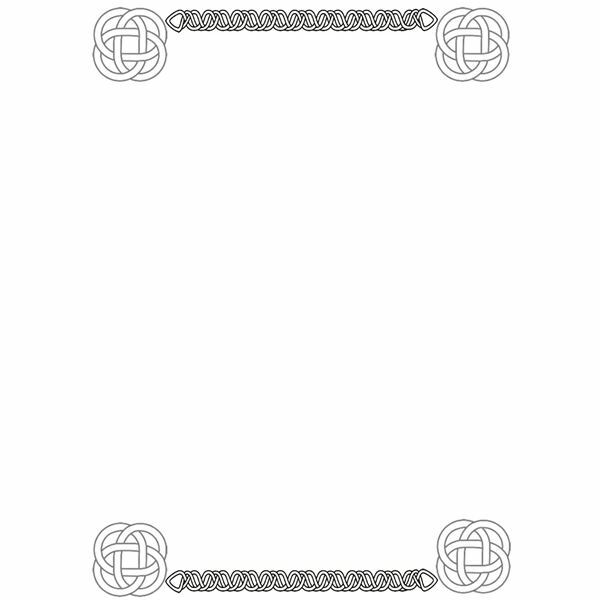 A basic border to start you off (don’t worry, more detailed designs are to come, if that’s what you’re after) is the Celtic Knot Frame. This design features classical Celtic knots to each corner, with a more twisted metal type edge in between them to lend more of a “sturdy frame” to your page. Although basic, the good thing about this design is that it leaves you with plenty of white space to fill in your text. A more sedate look like this is great for advertising homemade crafts, especially those with an old-time feel like handmade jewelry. It’s also grand enough to be scaled up and used to frame a poster for a medieval fair — use some Celtic glyphs to create your own look. In complete contrast to the one above, the Celtic Myth & Legend Rusted Metal Border is a bold design and proud of it. It’s so proud of it that it takes up a good deal of space on the page, but my, does it make a statement! Not an ideal design if you have lots of text, but if you want to get someone’s attention regarding an upcoming battle reenactment then it’s perfect. 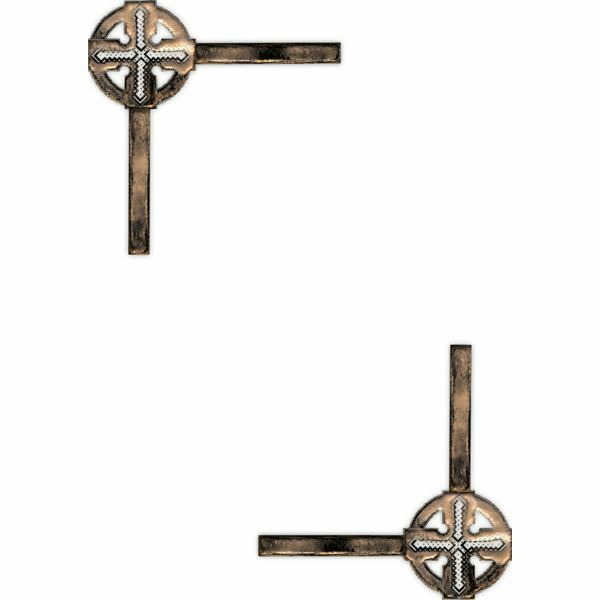 It was pretty easy to create this in Serif’s CraftArtist program using Celtic clipart and adding long rectangular shapes to join onto the detailed cross. I then grouped the items together and applied a metallic effect — a beaten up and slightly rusty metal. The great thing about this effect is that it still lets a lot of the detail of the original image shine through. It’s worth playing around with effects in your chosen DTP package to see what you can come up with — some results may surprise you. If you don’t have a DTP package then try the free version of Craft Artist. On first appearances, the Celtic Angular Knot Border is quite simple, but it has a lot of hidden detailing. Not only is it an appealing design for most of your Celtic art needs, it’s also a black and white affair, so you won’t have to dish out much in the way of printing costs. It features more angular twists and knots to other designs, with a featured knot in the middle — the transparency of this image was altered to make sure it was firmly a background feature, leaving your text unhindered and readable. If you don’t want this large knot then simply draw a rectangle over it, within the frame, and apply a white fill to cover it over. This frame, would also make quite a nice certificate border, if you added an embellishment to the bottom corner to feature a date or a “ye olde” wax seal. 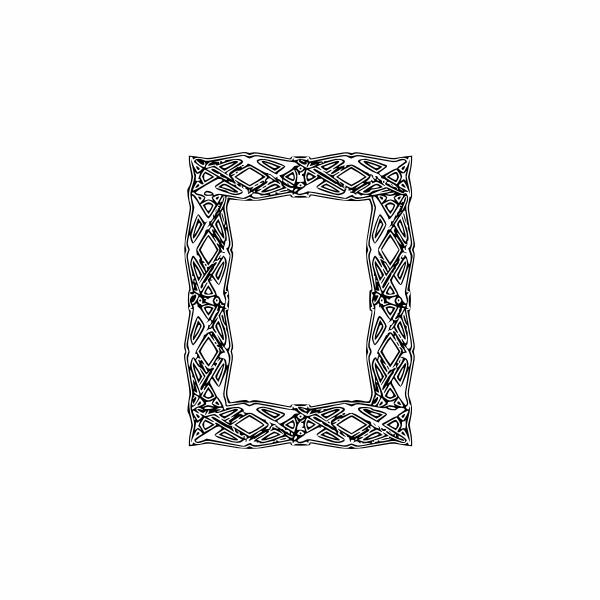 For a more feminine approach to borders of a Celtic ilk, the Celtic Knot Harlequin Frame design is sure to appeal. It’s actually made up of Celtic knot clipart, with one image copied and then ‘mirrored’ to the original to create the diamond shape — click to get a larger image and you’ll see the knot detailing. Wonderful for advertising Celtic crafts like jewelry and wood carvings, or even as an elegant notepaper. For a school project on the Celts, or even for a Celtic art project, you could use this as your main paper, and the one below for a great title page. Add some authentic Celtic fonts, and you have a suitably impressive result. If you want to make this one a full frame for your page, some copying, cropping and flipping of the current images will have you there in no time — this is easy to do as there are no patterns to match up or link together. 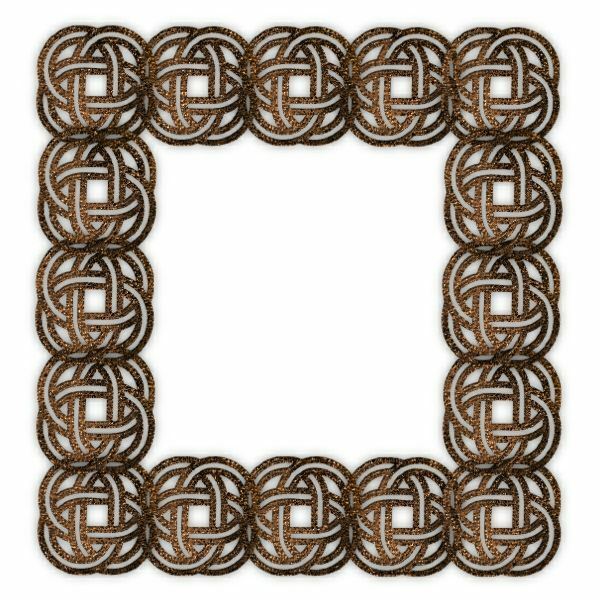 If you were after something that stands out from the crowd, and is truly authentic to the Celtic arts, then this Celtic Square Frame with Rust Effect border is begging to be tried out. 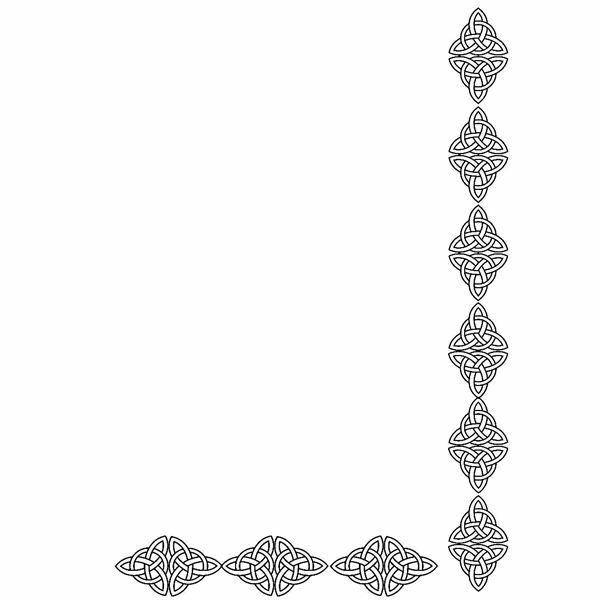 It uses just one Celtic knot (gained from a free clipart source), and was then copied and pasted with some care. It’s great if you can get a design like this one that flows easily, and can be intermeshed with the knot next to it — look for symmetrical designs to try this yourself. Once you have a grouping of two or three images together, you can then choose the group and copy from there to save you doing each, one by one. I then added an outline to it, and widened the line to make it stand out. A rusty metal effect was then applied to the whole lot, which also resulted in a nice background shadow to create even more depth. This is just the sort of Celtic border you’d have found in elaborately illustrated works of the day, or even as personal decoration. If you don’t like the square frame then it will easily stretch out to rectangular dimensions without looking too strange. 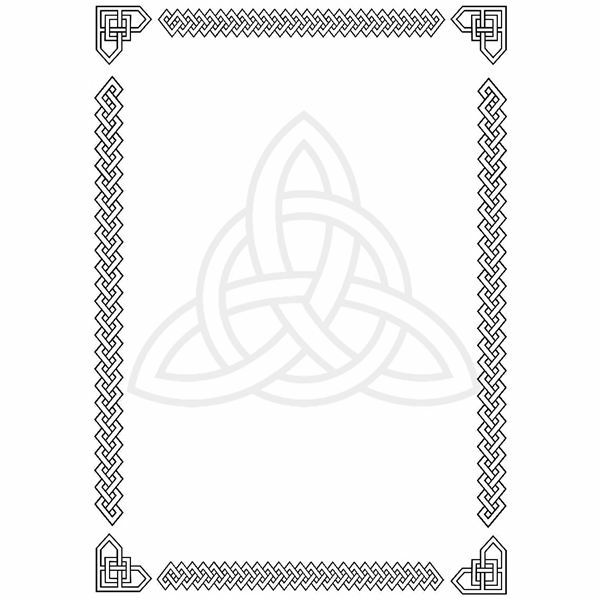 If you're in the mood to add your own touch to some of these free Celtic border clipart images, or even create your own from scratch, it's not nearly as hard as you might imagine. I've mentioned how easy CraftArtist is to use, but really most software has some ability for drawing (even Word), or you could sketch out your design by hand and have it scanned. Take inspiration from images from the Book of Kells, Tattoo artistry in the form of tribal symbols, or see if you can get hold of a copy of “Celtic Art: The methods of construction" by George Bain; which not only includes great pictures, it also takes you through how to create your own Celtic knots. You might also like to scan craft shops for Celtic style rubber stamps. Rubber stamping is an easy craft practice, just have a play around. If you get one particularly clear image, then again you could scan this and repeat it as many times as you wish using a software program on your PC. And with that, I wish you good luck and good morrow my fair knights and maidens! All other images were found or created in Serif’s CraftArtist.